After a few nights of ‘resort and relaxation’ it was time to head out on our own in what can only be described as the king of touring cars, our very own Ford Festiva. Having had a taste of the spectacular coastline when we took a 4×4 trip on our first day, I was itching to have the freedom to stop and explore at will. 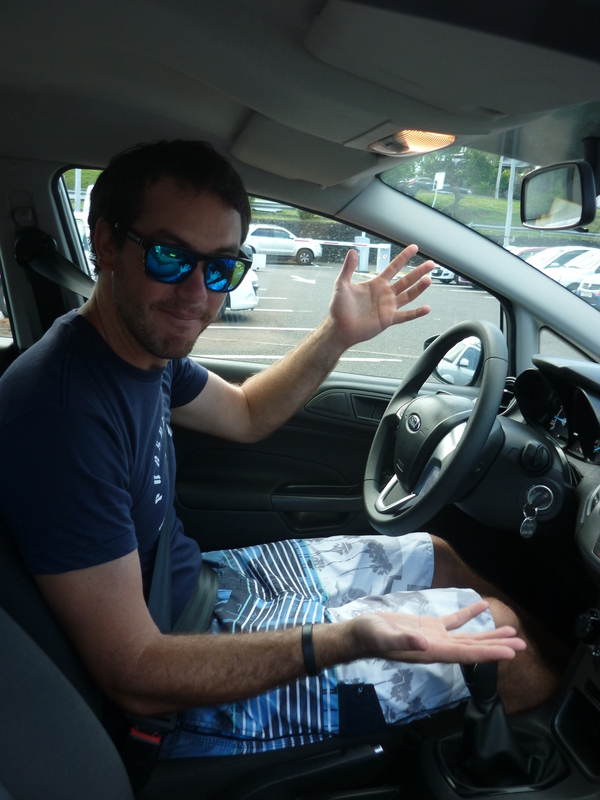 We collected the rental car a hit the road – the wrong side. For the driver the responsibilities of driving on the other side are endless… make sure you give way properly, choose the correct direction on roundabouts, don’t drive into oncoming traffic and kill everyone. For the passenger it is much simpler… get in the correct door and resist the urge to grab and readjust rear view mirror in panic. Just because you are in the seat you would normally drive from doesn’t mean you need to be able to see out the back. In case you are not familiar with Tahiti, the island is roughly square shaped and on the bottom, right-hand corner there is a narrow isthmus that connects it to a smaller section of island called Tahiti Iti. Confusingly if you take the road along the top of the island (the northern section), you are officially driving on the east coast road and if you drive along the bottom (what you might correctly assume was the south) you are driving on the west coast road. It is also worth noting that there is just one road that rings the entire island. I had a nagging feeling that this could become quite claustrophobic as you would literally be on the same road everyday with nowhere else to go. I also fantasised about some weird sci-fi or King-esque scenario that would see victims trapped in a bizarre , torturous loop of never ending, car advertisement-worthy, scenic driving. For those without hyper-active imaginations, you will simply enjoy the fact that the single road means you will be treated to spectacular views of lush tropical rainforest on one side and stunning beaches on the other for almost your entire journey. We selected the southern route along the west coast (yep, it hurt my brain too) based on the advice of our favourite ebullient visitor centre guide. He had marked many ‘must-see’ stops on the way to our destination. He had also marked heavy crosses through attractions that he didn’t approve of. The first was the aquarium which he dismissed as being inferior to popping on a pair of goggles and sticking your head underwater at any given beach. He also ranked it below the Sydney Aquarium which is underwhelming at best so I was happy to take his advice on that one. The second site that was scratched with a flourish was the Paul Gauguin Museum. Whilst I appreciated this brutal honesty, I again questioned whether this was the official Tourism Tahiti line. Our first stop was the beautiful white sand beach, Plage de Toaroto to enjoy a picnic lunch of bread, cheese, cold meats and pineapple juice and a relaxing swim. We exercised our new found freedom less than a kilometre down the road to stop at the next amazing beach we spotted, Plage de Vaiava, for another dip. 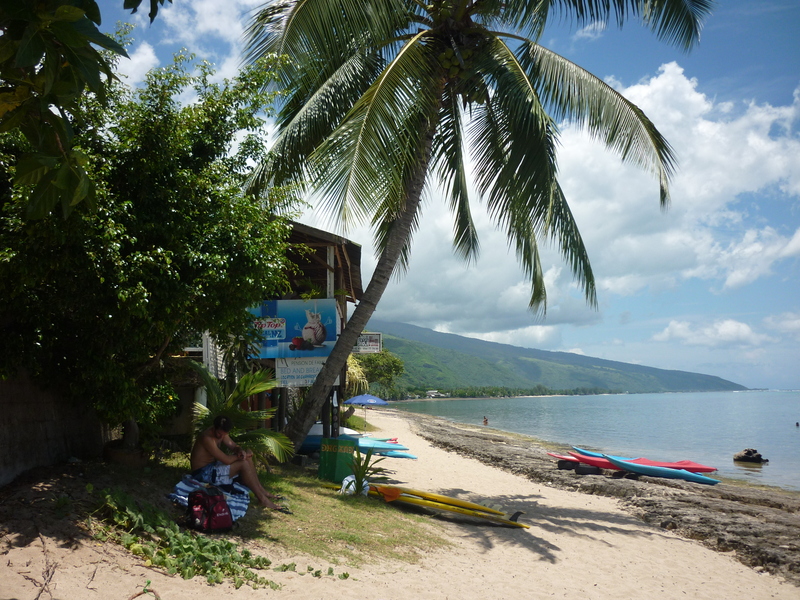 Swimming at Plage to Vaiava… worth bringing a snorkel or goggles. Tahiti signposts sights of interest for tourists in the ‘standard international brown’ colour and with just the one road it is exceptionally easy to find them. Several times throughout our trip we weren’t even sure what we were heading to… we just spotted the sign with the camera and thought it was worth pulling in and to take a look. The first non-aquatic mystery stop was at the ruins of the Arahurahu Marae. 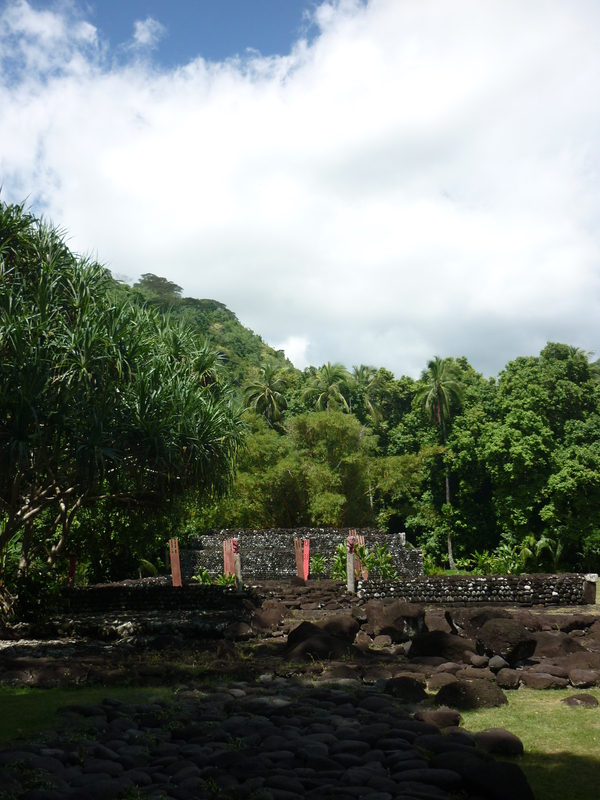 The Marae were spiritual spaces for social, religious, ceremonial and meditative activities for ancient Polynesians. 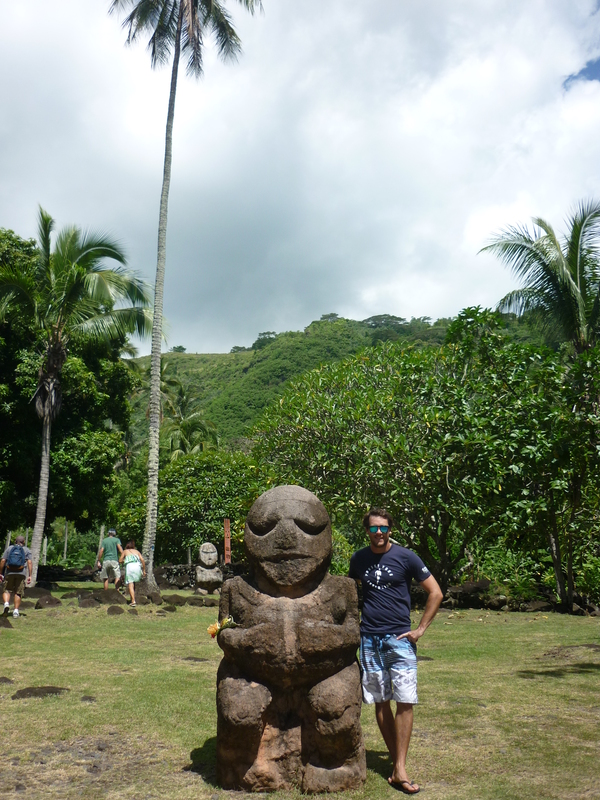 The site also housed to replica stone statues of two ti’i from the Austral Islands, the gods Moana and Heiata. We continued to wend our way along the coast toward Tahiti Iti and our final destination of Teahupoo. 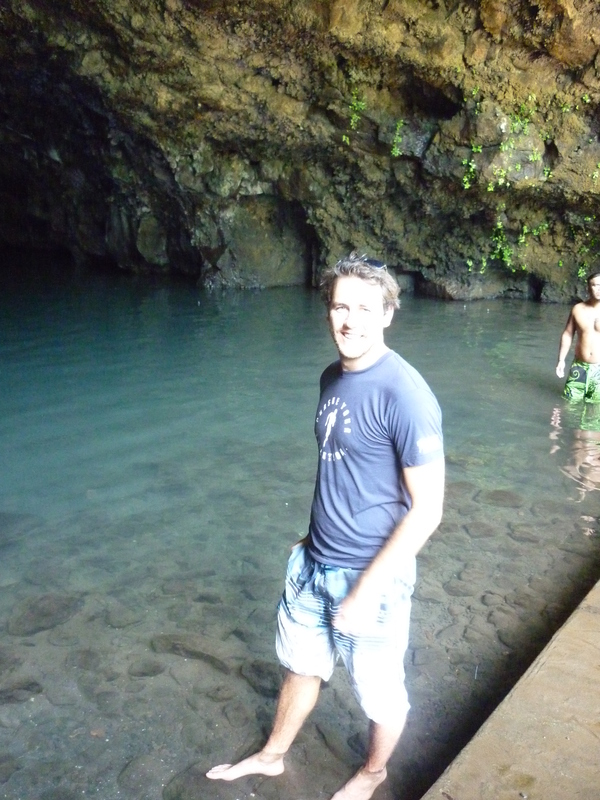 We stopped at some water-filled caves at Mara’a to admire them and to soak our hot feet in their icy goodness. From there the trip basically consisted of oohing and aahing as each bend and passing kilometre presented us with gorgeous beach after gorgeous beach, each more beautiful than the last. Many guide books will tell you to get off of Tahiti and head to another island as fast as you can, and if you were planning to stick to a resort near Papeete for the duration, this is probably not the worst advice in the world, (I would still argue that Papeete and surrounds is worth a night or two). All that said, if you have the inclination to hire a car and get out on your own, Tahiti is magnificent. Take several days and enjoy it. There are much worse ways to spend your time than beach hopping around paradise. This entry was posted in Not all about Brando, Travel and tagged beaches, self drive, Tahiti, travel. Bookmark the permalink.